Did you know it's International G&T Day this Friday October 19th? Celebrate with a Blueberry Gin & Tonic and some fun Gin facts! Superfood cocktails; not only does using Nexba tonic water mean you can enjoy G&Ts without any added sugar, but this one even contains superfood ingredients! Blueberries are absolutely packed with antioxidants (classifying them as a superfood) but if you're feeling adventurous, try adding in a teaspoon of butterfly pea powder. What is butterfly pea powder? Butterfly pea powder is made by grinding organic butterfly pea flowers. It's health benefits are similar to that of green tea; antioxidants, increased immunity, supporting heart health and boosting metabolism. Aside from the health benefits, mixing butterfly pea powder with lemon juice creates a beautiful blue/purple. It's the perfect natural alternative to food colouring! Firstly mix butterfly pea powder (if using) and lemon juice in a small bowl. Transfer to a large jar and add all remaining ingredients (except garnish). 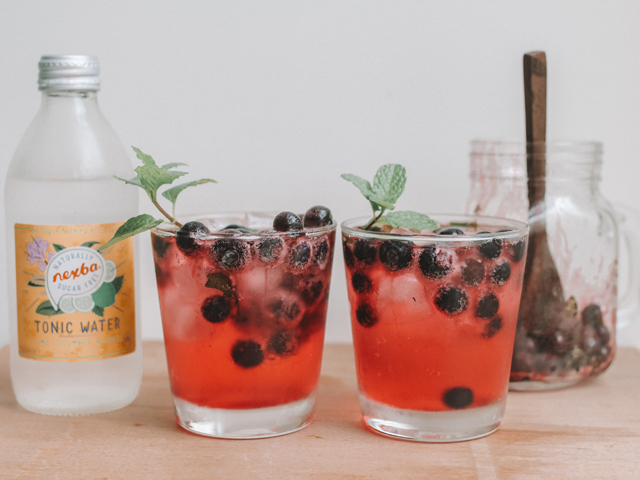 Pour into glasses and garnish with mint leaves and additional blueberries. 73% of gin in the world is consumed in the form of a gin and tonic. Early Australians would pay for Gordon's London Dry Gin in gold dust! Although gin and tonic is a classic British cocktail, the largest gin drinkers in the world are actually our neighbours, the Philippines, who are responsible for half of the world's gin consumption. G&Ts are best consumed under ultraviolet light to witness its glow-in-the-dark magic! The origins of the G&T can be traced back to the 19th century when British soldiers in colonial India needed to drink tonic water containing quinine as an antimalarial potion; malaria being the most widespread disease at the time. Gin and lime was added to the tonic water to counteract the nasty taste.